Had a very interesting day at Loos on our recent trip to France. A walk around the Hohenzollern Redoubt and the edge of the Quarries revealed some new remains that we had not seen before. This area was at the heart of the Battle of Loos in 1915. The area was the scene of initial success but following fierce fighting the Germans managed to regain lost ground. The lines then settled down for the next three years, with incessant mining and trench warfare. Unfortunately the weather was misty on our visit so some of the photos are not that great. 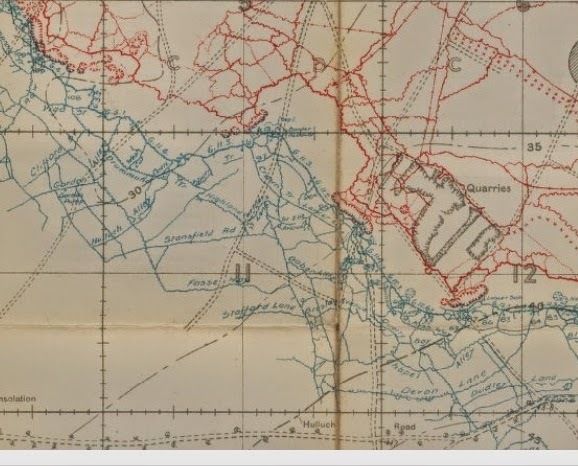 Below: Trench map of the lines in the Hohenzollern Redoubt and Quarries area before the battle. 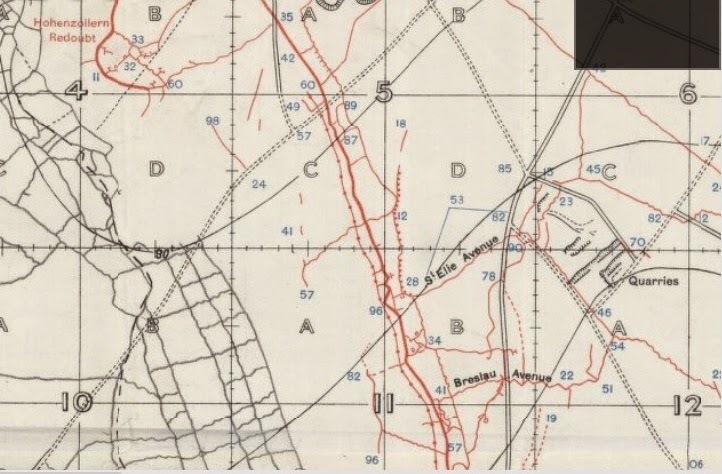 Below: Trench map at the end of the Battle. The lines were to remain so for the next three years, with some intense mine warfare as can be seen by the craters marked on the map. Some very good remains of the German front line, which include, trenches, dugouts, mine craters and remains of concrete emplacements can be seen today in woods just to the west of the Quarries. Below: Some of the remains of the German front line as it was after the battle had died down. Remains of a concrete structure in the front line trench can be seen, as well as dugouts, screw pickets and some impressive mine craters. 7th Suffolks were in this area during October 1915 - did not realize at the time, should have done my homework before the visit!! Below: A couple of German observation posts, constructed on the front German Line after the battle had died down. Below: Some views of the battlefield. First image shows the dominating position of the Hohenzollern Redoubt (the clump of trees on the high ground in the extreme background of the image), taken from what was no mans land in 1916. Second image shows the view from the German perspective, image taken from approx Big Willie / South Face trenches on the Redoubt. Last image shows a role of barbed wire, the Redoubt in the background (clump of trees). Next two images show Quarry Cemetery, established due mainly to the fighting for the Hohenzollern Redoubt (and Fosse 8). Contains may graves of cavalry units, employed as infantry. Final shots show some of the other areas we visited on the day. They include another German observation pillbox constructed on Hill 70 after the battle had died down, Dud Corner Cemetery (name given to it because of the number of dud shells fired on this spot during the battle) and Philosophe Cemetery (bottom image) - a new cemetery for me. Philosophe cemetery was taken over by the 16th Irish Division in 1916 who held the Loos salient at that time. Only a whistle stop tour of our day at Loos I realize, we did visit other areas but the images are crap because of the mist! We hope to revisit next year, so hopefully a more detailed post then. Just back from the annual visit to the First War battlefields. Most time as usual spent walking the fields of the Somme. Harder work this year, as due to the very dry spring, many of the winter ploughed fields had been finely tilled, much harder to come across things on this type of surface. So mostly pictures of shells for this year! Below: German Granatenwefer 15 round (also named known as the Priesterwerfer or Priestwefer as it was invented by a Hungarian priest named Vecer) and four 77mm rounds. The Granatenwerfer was a small spigot mortar. Below - two images of a selection of Mills bombs. The first pile was a result of some track widening at the back of Mouquet Farm. Second image shows three along Stump Road. Below: Two German 77mm rounds, near Flers. Perhaps the most amazing find of the week was the second SMLE rifle pulled up from the Gird Line. Only the barrel was sticking out of the ground. The soil was obviously not too corrosive as the images will show. The rifle's receiver also had its cover in place when lost (the imprint could be seen on the magazine). When we pulled it out of the ground the condition of the metal work of the receiver was obviously good, to such an extent that in parts the factory bluing was still evident. It was taken to the local museum in Pozieres, where it was washed down, and when sprayed with diesel and a bit of tapping, the safety catch was released and the bolt pulled back!! Amazing, considering it has been in the ground for almost 100 years. First two images shows it as found. Note the metal work condition on the receiver. Third image shows it after a hose down. Forth, fifth and sixth images show it after the bolt had been freed using a diesel spray. Last image shows it in the museum where it belongs. Next two images show a German 76mm minenwerfer round, Loos. These with the all aluminium fuze are apparently one of the most dangerous unexploded types of ordnance that are still found on the old battlefields; the bomb disposal squads will blow them up in situ rather than collect and take away for disposal as they do with most other shells, grenades etc. Below: British "cricket ball" grenade and fragment of granatentwerfer, Loos. Image below shows fragments of stick grenades and an oxygen bottle used for mine rescue and also for gas casualties. The system worked by mixing oxygen in the steel bottles with exhaled breath with carbon dioxide filtered out, allowing rescue to take place in areas with an unbreathable atmosphere such as mine galleries or collapsed deep dugouts. An unusual find at Boom Ravine. Image below shows an old fashioned razor, almost certainly part of a British soldiers kit. Found near High Wood. Below, a Mills bomb, Ovillers. Note the deep chalk slick in the background, which marks the location of the German trenches. The next image shows a 1 pdr pom-pom (37mm) round, Gueudecourt. Almost certainly fired in an anti-aircraft role as the British did not use these to support infantry attacks, preferring to use the Stokes Mortar instead. Both the French and Americans did use 37mm canons to support infantry attacks. Below, a British rifle grenade, Gueudecourt. Finally, a couple of shots of British HE shells, Gird Lines, to finish off with!